See? Even my tree isn't finished! My topper is MIA & tree needs a little more love! I am not prepared for Christmas. There I said it! I'm not done shopping, wrapping, cooking, cleaning, list making, or stressing (haha) . And I haven't sent a single Christmas card. Yikes. So I've decided, after reading Organizing Junkie's "Say yes to less," that I'm not sending anything out until it's worth sending. Because I'd rather do it right than do it to just to do it. And I'm sorry if that sounds like a terrible or selfish thing to say or do (and yes I could probably be slapping some cards together as I write this!) but I'm one of those people who likes cards to be personal. I cannot send a card without filling an entire side. And well, I also held out a littttttle bit too long thinking I would get a deal on photo cards. Okay, now you know it all! Thank you to all who commented about our poor little Daisy. 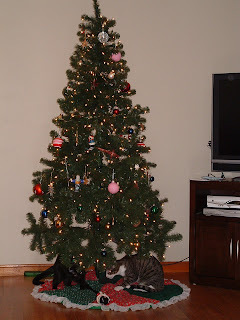 As you see in the picture, our cats LOVE the tree. And from what we can tell, Little Miss started biting at it and well, it didn't agree with her so well... so right now our Christmas Tree is closed off in our spare room & I'm feeling a little less jolly because of it. But she's fine now. See? When in doubt, blame the cats. On another note, I will be posting my new years budget soon so keep checking back! How are you getting ready for Christmas? And are you done your shopping? I am so not ready for Christmas. I'm usually done w/everything by Dec 1. I still have to buy most of my mom's gift, Ryan's parents, Ryan's brother and his girlfriend. I have to do up the baskets I'm making for my mom & sister...and wrap everything I've bought. Oh, and then I have to get some of those "just in case" gifts. I was planning to get a lot of that stuff done tomorrow while snowed in, but Ryan wants me to be snowed in with him at his place instead.